03.24.2004 - This is a very typical dead animal removal scenario here in Florida. Because of the high water table, the houses here do not have basements. Many homes have foundations flush against the ground, but many are elevated off the ground, with a crawlspace underneath. These areas are magnets for wild animals - they provide a safe refuge from the elements and a good place to set up a den. Opossums in particular like to live underneath houses. Opossums don't live very long - about 2-3 years in the wild. They're very common around here, and they simply die frequently. They actually seem to choose to die indoors. I rarely encounter outdoor deaths like I do with other animals. So even if they're not already living under the home, they may choose to crawl under there to die. Once they do die, they decompose, and the homeowner most definitely notices this. Adult opossums usually weigh about 9-12 pounds, and that's a fairly large amount of decaying mass. The odor is very strong. It often makes the home unbearable. When I'm called out to a home with a dead animal smell, the first thing I do is check to see if it's an elevated home, and if so, I check to see if there's access underneath, and if the odor is coming from the perimeter of the home. I also look for flies. In this case, I found all three - several openings which should have been screened shut, a bad odor coming from these opening, and flies going in and out. I put on my disposable Tyvek body suit, which keeps me reasonably clean, and got my HEPA filter mask to block out the dirt/dust under the home, and to shield me from the odor (I do have to get up close and personal with the source, of course), and I got my headlamp and bodybag and trowel and BioShield. I crawled underneath, and luckily, this was as easy as it gets. First of all, the ground was covered with a black tarp! This made everything very clean. Second of all, I had plenty of headroom and there was no clutter or architectural obstruction. Sometimes I have no space and I have to wiggle through very tight areas, or even dig my way through tight spots. This is one of the reasons I carry the trowel. This opposum was right out in the open - no difficult search at all. If only they were all this easy! I normally bag the animal and then throw dirt on the remnants (fur, juices, maggots, etc) and bury them, but in this case I was able to simply bag the opossum and get out of there. Easy pickings! I love dead possum removal. 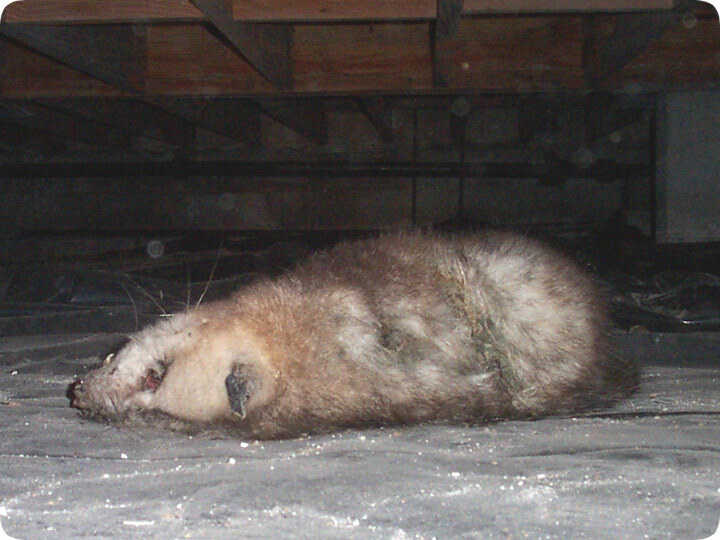 A dead animal under a house can be a stray cat, a raccoon, or even a rat, but an opossum is the most likely culprit.